U2 singer Bono walks inside transparent LED video screens during a concert in Boston on July 14, 2015. Irish rockers, U2, are continuing to innovate in their use of video on the current Innocence + Experience tour, and behind the scenes is some extremely high-performance, all-flash technology. Video show director, Stefaan "Smasher" Desmedt, is using an all-flash configuration of a ruggedized EMC VNXe3200 to help run the spectacle, pulling new video projects and archived footage to show on massive specialized displays that hang overhead. He also incorporates live video as it's being captured for display on the conventional giant screens that are commonly seen in arenas. The visual centerpiece of the show is an eye-catching tunnel suspended above the catwalk that extends from the main stage, the walls of which are two semi-transparent LED video screens that are 29 meters wide and 7 meters tall. Each screen uses 240 individual V-Thru panels from Saco Technologies. 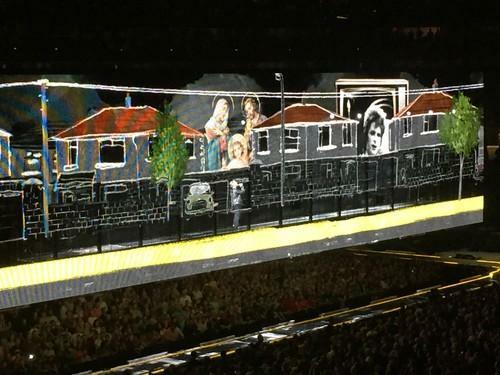 A walkway runs in between the screens, and during parts of the show such as the song "Cedarwood Road," lead singer Bono climbs up into the assembly and appears to interact with the video and graphics projected on the screens. This tour marks the first time that Desmedt and his team have archived video to such a great extent, and had that content to pull from during shows. Previously, they might have saved video from only one camera, showing a wide shot, as a reference, he said. They're using an EMC Data Domain system to back up all the video data from the tour, about one terabyte nightly. Desmedt travels with a full broadcast crew that films from more than 20 cameras during the show. All that material -- expected to be about 50 terabytes archived by the end of the tour -- will give the team more to choose from when they create DVD products from the tour. "I don't believe in coming in and doing one show and putting it on DVD," Desmedt said in an interview before the band's July 14 concert in Boston. Both the VNXe 3200, which can store up to 450 terabytes of data, and the Data Domain, are in 2U form factors that fit standard racks; Desmedt is using two of the flash arrays. The Data Domain 2500 can store up to 6.6 petabytes, and has maximum throughput of 13.4 terabytes per hour, so the nightly backup can be accomplished before the team packs up for the next stop on the road. Desmedt, who has also worked for acts such as Madonna, Prince, and the Rolling Stones, starts his day by talking to the band about the set planned for that evening. On the current tour, "the first bit is quite static because there's a story being told, and we have to stay with the narrative," he said. In the second part of the U2 show, he does more on the fly, pulling content from both the array and the live cameras. Desmedt, who is based in Bruges, Belgium, drives the video show using software from d3 Technologies, running on a d3 4×4pro media server. He creates the video content using d3's software on his custom-built PC. "You can't do it on a Mac, it's not powerful enough, they're so behind on all this stuff. You need something on steroids," he said. His multicore setup uses a backplane architecture to get the performance he needs when, for example, layering three or four sources of uncompressed video. Having all the video content easily accessible via the flash array makes it possible to tweak the show on the road as the artists demand. When U2 wanted to change something in one of the set pieces in Boston, "I immediately went in there and made changes. The whole project is living with us, and that's what makes it really quick," Desmedt said. "You don't want to be in a hotel room downloading ten gigs for a video clip. We try to do everything locally, and carry as much with us as possible."